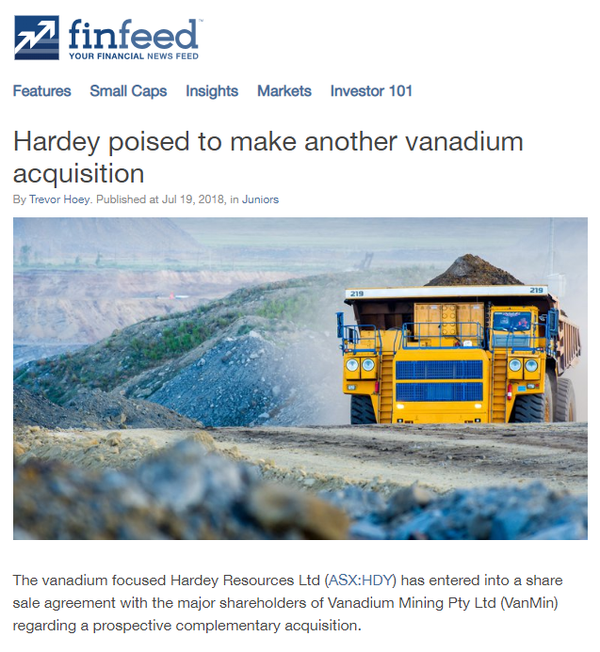 The good news keeps rolling in for Hardey Resources (ASX:HDY) as the company rapidly transitions into the increasingly lucrative vanadium arena. HDY made the strategic decision to enter the vanadium space signing a share sale agreement last month to acquire 100% of the issued capital of Vanadium Mining — a mineral explorer that owns six highly-prospective vanadium plays in Queensland and the Northern Territory. That news came just weeks after HDY announced its proposed acquisition of Nelly Vanadium Pty Ltd — a mineral explorer that owns the Nelly Vanadium Mine in Argentina’s San Luis Province. Hardey is now undertaking the required due diligence on the projects ... and so far it certainly looks encouraging. As we reported last week, its fast-tracked due diligence process at the Nelly Vanadium Mine has revealed even more potential for the highly prospective project than first thought. And now, HDY has promising news to report from its due diligence on Vanadium Mining’s four Queensland projects – Sharptooth, Spike, Cera and Petrie. Early due diligence on the projects suggests that each come with significant exploration upside. HDY confirming they are all within an enriched vanadium mineralised zone and confirmed the prevalence of the Toolebuc Formation across the projects. 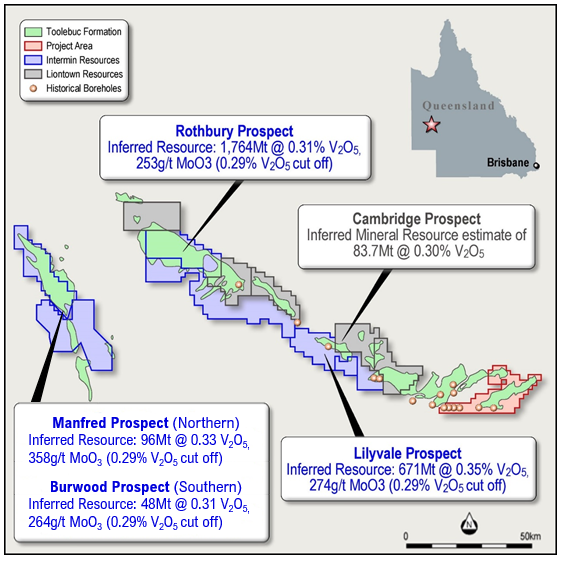 Also encouraging, is the fact that Vanadium Mining’s Queensland prospects are located not far from Richmond Project owned by A$39 million-capped Intermin Resources’ (ASX:IRC), which hosts an Inferred Mineral Resource of 2,579Mt at 0.32% vanadium oxide (V2O5), at a cut-off grade of 0.29% V2O5. 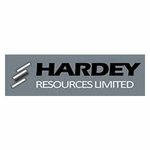 When assessing the Queensland projects holistically, HDY’s geology team believe that there is adequate historic drilling and sampling data to potentially geologically model a JORC (2012) compliant inferred Resource. HDY says it is “delighted” with the prospect of being able to model a JORC compliant inferred vanadium pentoxide Resource, explaining that this will materially de-risk the Queensland projects. 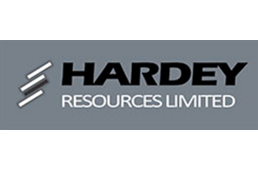 The Queensland vanadium projects of Hardey Resources’ (ASX:HDY) acquisition target, Vanadium Mining, are in the spotlight today. As its pre-acquisition due diligence on the company’s Sharptooth, Spike, Cera and Petrie projects continues, HDY has confirmed that each are within an enriched vanadium mineralised zone — meaning there’s significant exploration upside on offer. Within each project area are significant — outcropping and below surface — occurrences of the Toolebuc Formation, which is an oil shale highly prospective for vanadium mineralisation and secondary oil-bearing potential. HDY has substantiated this finding by reviewing historic geochemical and drill-hole data. It has also evaluated exploration undertaken by peers, Intermin Resources (ASX:IRC) and Liontown Resources (ASX:LTR), at their projects which are close to the Sharptooth project and also within the Toolebuc Formation. 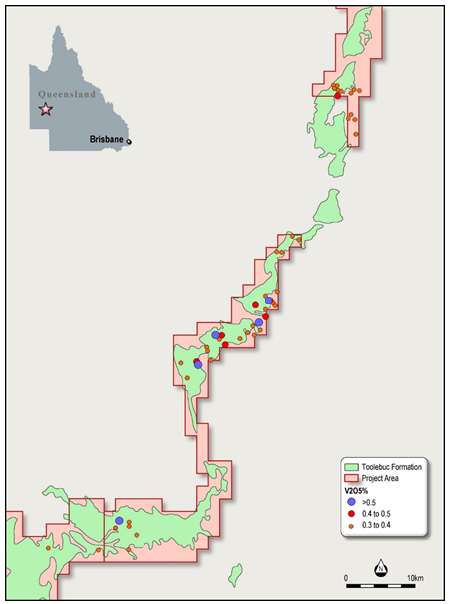 The commonality with the four Queensland projects undergoing due diligence – Sharptooth, Spike, Cera and Petrie – is outcropping and below surface occurrences of the Toolebuc Formation. In geological terminology, this is an oil shale that is prospective for vanadium mineralisation. Notably, the Toolebuc Formation has a shallow, favourable dip and occurs from surface to 5m below. The Toolebuc Formation’s thickness below surface typically averages 12m, but this can reach 25m in places. Historic surface sampling and drill-hole assay results within the region confirm vanadium mineralisation is apparent within the Toolebuc Formation. Between 2008 and 2013, over 170 air-core (AC) drill-holes were completed across the north-south trending Spike, Cera and Petrie projects to an average depth of 30m. The geology team has reviewed the drill-holes within the tenure and reported grades of more than 0.5% V2O5. The future focus will be to expand the area of historic drill-hole interpretation to extrapolate the data across the projects, which have a strike length of 150 kilometres, with the aim of defining an exploration target. It still has a lot of work to do to prove this potential, so investors should continue to take a cautious approach to any decision made with regard to this stock. The map below identifies the vanadium grades at each of these three projects. Notably, the Cera project has numerous intercepts exhibiting elevated assay results up to 0.58% V2O5. Illustrating the extent of mineralisation, Interim Resources (ASX:IRC) have reported a JORC (2012) compliant total Resource for the Richmond project of 2579Mt at 0.32% V2O5 (0.29% cut-off), while Liontown Resources’ (ASX:LTR) Toolebuc Project announced a Maiden Inferred Resource of 83.7Mt at 0.30% V2O5 (0.29% cut-off). These projects lie along strike and align with the Sharptooth Project, as seen in the map below. The Sharptooth Project area is highlighted in red, alongside the prospects of Interim (blue) and Liontown (Grey). Note the Toolebuc formation running along all of the project, as marked in green. The Sharptooth project has five historical drill-holes with V2O5 assay values up to 0.32%, which exceeds Liontown Resources’s average grade but is in line Interim’s reading. There are around 170 air-core (AC) drill-holes, averaging 30m depth, across the north-south trending Spike, Cera and Petrie projects, which have a combined 150 kilometre strike length with widespread elevated V2O5 assay results. HDY is diligently adhering to its strategy of fast-tracking due diligence on Nelly Vanadium Pty Ltd’s Argentinian assets and Vanadium Mining’s NT and QLD assets. 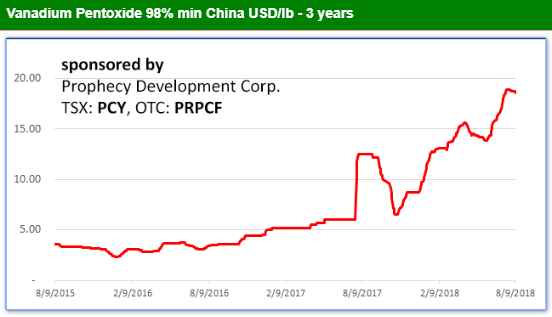 A quick look at the impressive performance of the vanadium price in recent years goes far to explaining why HDY is putting its head down and getting on with the job. Vanadium Price has risen sharply over the past three years. However, it should be noted here that commodity prices do fluctuate. Seek professional financial advice before choosing to invest. And with the future of Vanadium Redox Flow Batteries and their ability to store large grid energy, there is likely to be plenty of further upside ahead. In regards to the Queensland vanadium assets of Vanadium Mining, from here HDY will continue to work to ascertain if a JORC-compliant Resource can be determined from historic data. It will then progress due diligence on Vanadium Mining’s Northern Territory assets. Additionally, work continues in Argentina as HDY completes its due diligence prior to completing the acquisition of the Nelly Vanadium Mine. HDY is fast-tracking pre-acquisition due diligence and teams from SRK Consulting and Condor Prospecting have moved quickly to commence the inaugural site visit to Nelly Vanadium Mine.